Japa Malas are traditionally used to keep track of mantra repetitions while meditating. 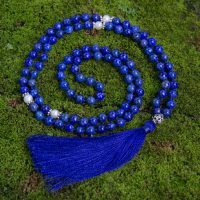 However we can all wear a Japa Mala even if we are not a Buddhist, Hindu or Yogi; they can be used by anyone for setting the affirmations of what they want to manifest in their lives. Our mala beads are universal and non-denominational; our hope is that by wearing them people will be inspired to live peaceful and intention based lives. They are also an excellent reminder that you are capable of amazing things; they will infuse you with some extra security, peace and reassurance which you can call upon on at any time. Each mala is made up of 108 +1 beads. Why 108? 108 is an auspicious number. Our bodies contain 108 major “Nadis'” (physical and subtle energy channels) that reach the sacred heart. By chanting a mantra 108 times the energy from the mantra permeates both the physical and energy body. 108 represents many more things including: the number of Upanishads, the number of names of Hindu Deities, Nataraja’s 108 dances, 108 Holy Temples of Vishnu, number of masculine and feminine letters combined in the sanskrit alphabet etc. 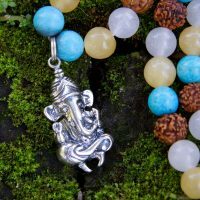 The 109th bead, also called the ‘guru’ bead, signifies the beginning and end of your meditation practice. The Guru bead holds the intention of your mala. By wearing Mala beads, you embody the intention you set when you meditate with them and that mojo will be carried with you throughout the day. Specific stones and gems have their own particular vibration and energy. Choosing them is mainly about using your intuition and listening to which one resonates with you personally. Remember that gemstones will choose you as much as you choose them. Sometimes we hear: “It just caught my eye and no matter what I did I couldn’t get it out of my mind.” That’s what is meant by a stone choosing you. Another good start in finding the right stone is if you have a goal in mind for the stone. Know the properties of each stone and you will find the one you are looking for. If you go to a Vipassana or a healing retreat, the Malas will absorb that silent and peaceful vibration and by wearing them, that energy will always be with you. Enjoy them and remember to thank them too! Malas are a kind of rosary and although they may be worn as jewelry they should be worn and hung with care. How often you cleanse your mala will depend on how often you wear it, and the situations you encounter. If you happen to be in the presence of some negative or unwanted energy, you may want to cleanse your mala; you can do this by placing it outside under the full moon overnight, or by smudging dried herbs like sage, cedar or lemongrass. You can also burn some Palo Santo to purify and cleanse its energy. Also, after much use you can also physically clean your mala by placing it in warm water with a mild soap if necessary.